Several iPhone app developers have teamed up to launch PhotoAppLink, a new open source initiative that aims to simplify photo editing by tying multiple photo-editing apps together. As you know, there are an incredible number of photo editing apps in iTunes today, and often, each especially excels in one particular area. For example, converting photos to black and white, cropping, compositing or writing on top of photos are all features of popular standalone apps. But what about when you want to make multiple edits using multiple apps? That’s a far more complicated process. And it’s the very problem PhotoAppLink aims to solve. Currently, in order to edit your photo in multiple apps, you have to save the edited photo to the camera roll each time as you move in between applications. 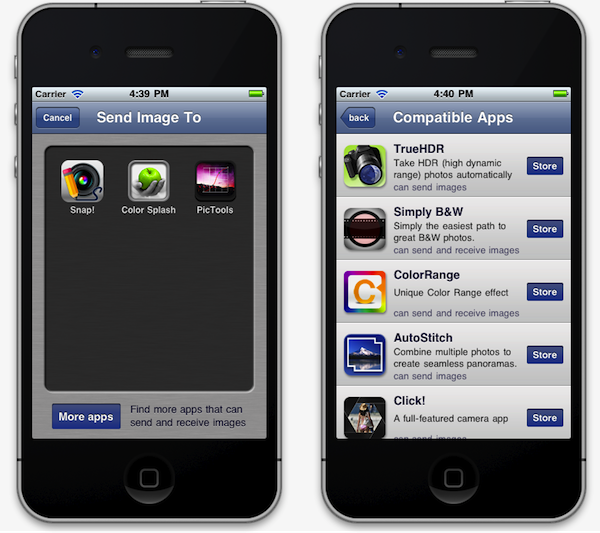 But with PhotoAppLink-enabled apps, you can simply select another app to use from within your current app. From the PhotoAppLink interface, you tap the app you want to move to and it’s launched for you, photo edits intact. You can move back and forth between photo-editing apps, too, as you continue to work with your image. In order for this feature to work, a group of photo app developers got together and agreed to implement PhotoAppLink within their apps. Originally conceived by app development shops PocketPixels and CodeCrop, the feature is now live in Snap!, Color Splash, Simply B&W, PicTools, AutoStitch, TrueHDR, Juxtaposer, Click! and Photogene. Several notable developers have already committed to adding PhotoAppLink support in forthcoming updates, as well. Confirmed apps include: PaperCamera, PhotoToaster, ColorBlast!, Color Range and MobileMonet. Other interested developers can choose to participate in the initiative by grabbing the source library here on GitHub. Besides making it easy on end users to hop between apps (certainly a pain point for photo enthusiasts), the new feature will have the added benefit of increasing the opportunities for discovery through other, compatible applications. To this end, PhotoAppLink also includes a commissions program for developers, which pays out a percentage of the sale for new apps discovered and purchased through the PhotoAppLink interface. In addition to ease of use for end users and discovery for app developers, a third benefit is the feature’s potential for increasing user engagement within niche applications. For simplicity’s sake, users may have previously skipped using the better-functioning app in favor of a more basic “all-in-one” to avoid hassle. But by daisy-chaining apps together like this, it’s easier to use the best app for the job, while still saving time. 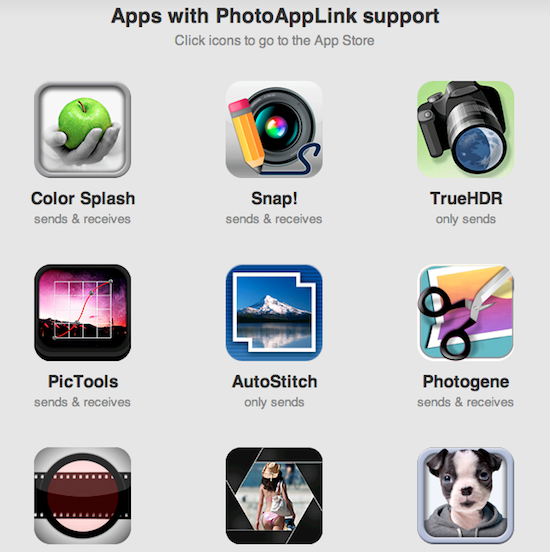 You can see all the supported apps where PhotoAppLink can be found on the project’s homepage here: http://www.photoapplink.com.